>Do You Have Air In Your Tires? >Last night I set out to rototill the garden. Getting the tiller out after its long winter nap is often a challenge and last night was no different. After filling it with gas and checking the battery, etc. I turned the key and…nothing. I fiddled around a little, then tried the pull rope. One yank and the engine sputtered to life. Glancing downward I noticed that one of the tires seemed a little flat but I decided it would be ok until I got down to the front garden. Excited to see that first turn of the soil, the tiller and I headed to the back garden. We hit the edge of the garden and I engaged the tines. “Here we go” I thought. “Finally time to play in the dirt!” As I eased the tiller into forward motion we set out, tines breaking the ground and turning the soil beneath them. Something wasn’t right. The tiller kept veering off to the right and I had to constantly fight to keep it in a straight line. I muttered and fought, but nothing I did seemed to help. Then I looked down. The tire that didn’t seem so bad earlier was so flat that the rim of the wheel was down in the dirt. 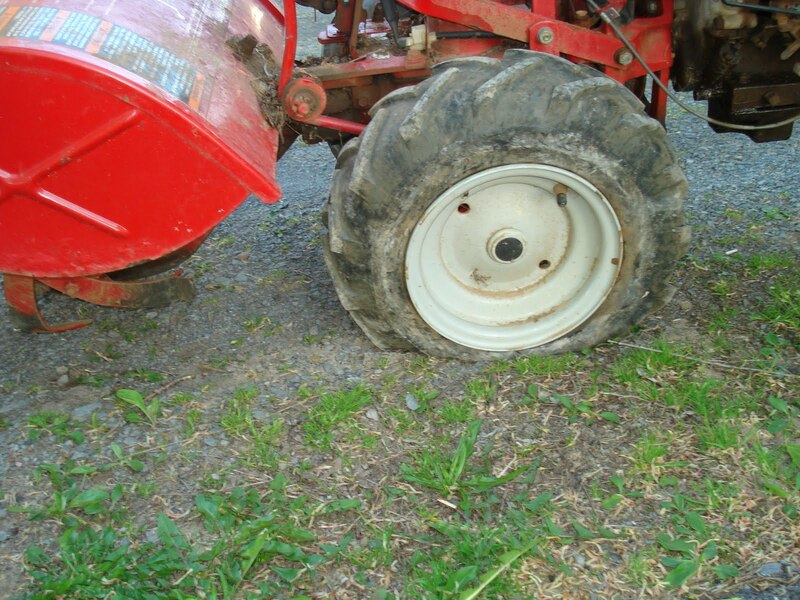 Since it was the tire on the right side and the left tire was ok the tiller kept going off course. After chiding myself for not taking the time before I got started to fill the tire in the first place I steered the rototiller (the best I could) towards the garage and the air compressor. After a little fill-up the tire was full and the tiller cruised back to the garden straight and true. As I continued with my tilling I got to thinking about how poorly my life seems to go when I’m not “filled up”. It’s not the air compressor that is essential for me. I require daily (at least) filling with God’s word and a some quality time with Him if I want my life to be straight and true. Just as trying to get by without putting air in the tire of the rototiller made me frustrated and kept impeding my progress in the garden, not filling my heart and soul with God’s word and listening for His direction each day puts me off course in life. I find myself frustrated and wondering why things don’t go the way I want them to. But when I take the time to submit to God and allow Him to fill me up my day starts with a sense of peace and I look forward to what it will bring instead of setting my agenda and getting bent out of shape when it goes awry. Has the “air” gone out of your tires? Are you missing something in your day and can’t put your finger on it? Try spending some time with God and seeking His word. I’m certain you’ll walk away filled up and ready to walk in the peace that He has for you today. >I thought I had learned this lesson, but alas, here I sit reading my e-mail before reading Scripture. I needed to reveiw this lesson, and needed to do it today. Thank you.